The Seagulls face Spurs following successive losses against Liverpool and Huddersfield, conceding seven goals in the process. 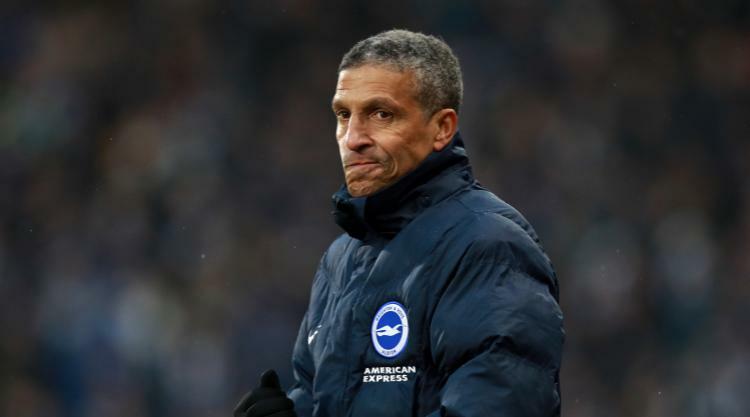 "It's important we react, and one thing that we've tried to do throughout the season so far is to make sure that everybody is level-headed - both the players and everyone around the club," Hughton told Brighton's official website. "We know how difficult this division is, and we knew we were going to have difficult periods. "It shows how well we've started that we've lost two on the bounce and we class it as a difficult period. But this is going to happen, and has done to a lot of teams around us. "In this league, the games are difficult, and we've got to show that we accept what the division is and that you learn from it and do your best in the next game. "It's disappointing that over a two-game period we've conceded seven. "The manner in which we conceded against Huddersfield was disappointing, but if we think that we have done something poor then we have to make sure it's better on Wednesday." Spurs are fresh from a 5-1 thumping of Stoke, but Hughton says his players will relish the challenge. "It's a tough game at any stage of the season, but they are on the back of a good performance at the weekend against Stoke," he added. "It's another example of having to do enough good things on the day as a team to make sure you stay in the game and are able to give a good account of yourselves. "They are a top-six side, and if you are not on it you will be punished. But it's a challenge to look forward to, and a majority of our players haven't played at Wembley Stadium, and that's the wonderful challenge for them as well. "We have to have the right balance. If you defend for 90 minutes, then the inevitable will happen at some stage and they will open you up and score. We have to have periods where we have good possession and show that we can be a threat. "Where you are able to, you want to try and play in their half too, because you are up against talented players who are good on the ball, and you want to be able to retain possession."